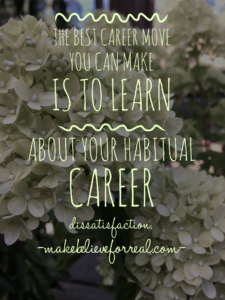 5 signs you should’ve never taken that job | Career Counseling for Your Career Bliss | make. believe. for real. Job offers are seductive. You feel so rewarded for all that effort. You won. You’re the one out of all the other possible applicants that got offered the job. You even celebrated this fact with a night out, a new outfit, or a toast. But as we all know, the high of receiving the job fades. It fades much sooner than we’d like. And what was once the distant mirage of a better and brighter future is nothing you actually want up close. You might even find yourself wondering why you didn’t know how to appreciate the last job if you were only going to feel this way again? It’s more than a little disorienting. It’s annoying and agonizing and you don’t know how to trust yourself after this has happened multiple times. What’s different this time is that you want to know why you have this affliction. It’s not that the signs weren’t there. It’s that they were and you either ignored or didn’t know how to interpret them. Now that you’re in your new day-to-day, you actually have the information that could have been useful before you ever accepted that job offer. So before you find yourself thinking that something is wrong with you (it’s not that at all! ), unpack the indicators that the job was never going to the work for you. For this is how, through self-awareness, you can start to really trust yourself again. No. 1 – You got this new job because you hated your last one so much. You might be thinking: “Um, well yeah … what else was I supposed to do? !” What you don’t realize is that this is probably a pattern by now. Using your hate for one job as the motivator to becoming happy in another job is actually an emergency situation. So you begin moving from one emergency situation to another as quickly as your dissatisfaction can sink in. The signs that you want to quit actually give you lots of advance notice if you start to pay attention to the cycle or pattern you’re enacting. Peaceful and satisfying transitions are a process so create one for yourself rather than a state of emergency as the impetus to act. Also, hating your job is a sign that you’re not considering choices that might be easy to make if you unblocked some of your early social conditioning with the help of a suitable professional. Remember all the options you always see in hindsight? This time isn’t going to be any different. Plus you can have more access to hindsight in the now if you are present and real with yourself about why you’re feeling hate in the first place. No. 2 – Your boss and/or colleagues weren’t welcoming. It’s convenient for everyone to claim that they’re busy especially when you come on board prepared to “hit the ground running.” But when your job involves helping other people in some way (and whose job doesn’t? ), if your boss and your colleagues are expecting you to put in the greater effort so that you can help them (aka please them at your expense), maybe admitting that sooner rather than later can save you the investment of applying for and accepting the job. If becoming part of the team is a top priority for you to feel at home in your work, you can ask how your interviewers were on-boarded into their roles and what’s in store for you. You can also extend the interview by asking for a pre-visit to see your work space, meet your (soon-to-be) predecessor and anyone that you’ll be interfacing with regularly on the job. During this pre-visit ask where the paper is for the photocopier, or how the shared spaces (coffee area, kitchen, meeting rooms) are cared for. Listen to what’s being said as well as what’s going unsaid and be honest with yourself about that. If you get “that feeling” or signs that that they are more glad to dump work onto you than to integrate you, it’s not worth it for you to “try to make things work.” Sometimes workplaces don’t want a colleague, what they want is to keep doing what they’ve always done using hope as a strategy that this time things will work out differently. And when that’s the case, it’s you that needs to see when and how that’s happening to save yourself the trouble. No. 3 – Policies about major duties have yet to be decided. Once you’re on the job, you learn that certain things are expected of you that may or may not be expected of other people. I once worked at a job where I was told that traveling was a perk of my job so I should not expect any time off after crossing international time zones. The same logic didn’t apply to my male colleague and the person that was responsible for making this decision (not my direct report) kept canceling our meeting to talk about it. Needless to say, I couldn’t physically sustain that job for very long and getting answers was a circuitous process. Ask if there are any gray areas in your job and who is responsible for resolving those with you once you’re on the job. If it’s not your direct report, ask that it be your direct report and/or ask about why it is the way it is. You’ll learn a lot from the answer if you pay attention. Especially if your concerns are being brushed off as something to be taken care of after you start. Alternatively, you could ask about what happens in a worst case scenario (e.g. “If I’m overseas for two weeks and come home and have to be on the plane two days later again, do you expect me to come into the office or would you feel okay with me working from home so that I can prepare for my next trip?”). If “how things work” don’t make much sense to you or it sounds like no one fundamentally trusts each other or respects the nature of the job, acknowledge this. If this job means that much to you it’s okay to say: “I’m not entirely comfortable accepting this job with these things unresolved. I don’t want to quit due to burn out.” Doing this does two things: First, it makes what is going to be a problem that leads to you quitting, into an emergency because most workplaces respond to something only if it’s urgent (yes, we live in a culture that prefers our comfort, which makes us lazy to act, so creating a sense of urgency isn’t a bad thing). Also if you’re the candidate they picked, then you’re the candidate they want so this makes something unresolved into something resolved. And if they don’t want to do anything about the obvious problems to bring you on board successfully, then guess what? You’ve saved yourself all the trouble before you ever started the job. 4. Your boss or colleagues were codependent and you don’t want to be (… anymore). You’re on a team where someone’s work ethic is questionable or at the very least, not shared with others, and you find yourself compensating for them by over functioning in your role. This can include checking on their work, devising strategies to “work around” an under functioning or interpersonally difficult team member, talking to your boss to try to create change, etc. The sad part is that a lot of effort goes into keeping everyone playing their part rather than resolving anything. All this “extra work” so that you can do you work is tiring and your boss indicated that your agreeableness is so appreciated. It feels totally yucky and tiring. Ask for what you want. If the under functioning colleague has the audacity to be a certain way and to ask for certain things, have the audacity to be authentic and ask for what you need to be able to be in your job sustainably. Know that you are of value to the organization and promise yourself that if a job is meaningful to you that you’re not going to let an under functioning colleague deny you your career bliss. And don’t wait until you’re angry or frustrated to start doing this. Beginning this practice from the very beginning means that you can say “yes” to a lot more than needing to quit from burn out. Don’t keep trying to be a martyr. 5. Your parents never wanted you to do that kind of work anyway. Sometimes you get the job you want and it doesn’t work out. And you try again. And again and it keeps “not working out.” There’s no real reason for it. You make up reasons that sound socially acceptable (e.g. “I didn’t like my boss.”), but really, your parents think that what you do is either beneath your ability or above what’s acceptable and appropriate in the family. Basically you’re self-sabotaging to protect your family from feeling uncomfortable by failing at what you do for work (even if that means being “unhappily successful”). Fully understand that your parents (or other early primary caregivers) were the most influential force in your life growing up. This is because they taught you what you needed to do in order to be accepted and followed along to ensure your survival. In adulthood, we underestimate the strength of the will to survive with whoever was charged with our care all those years ago. So whether you selected your current work because it preserves what is labeled as a “strong family bond” or rebelled righteously in order to “do whatever you want,” you may still have this parent-child dynamic leftover from childhood to sort through. And you may require the services of a helping professional to untangle from it. So ask around and interview a few professionals to find someone that can help you grow from codependence to interdependence. But first, you need to not be embarrassed about the fact that childhood wounds make adult experiences pretty bumpy until they’re acknowledged regardless of whether you were intended harm, and especially if you were not.